Being the host for the annual holiday get together can be a little stressful. Making sure everyone’s gifts are wrapped and under the tree, preparing the feast for all to enjoy, decking the halls with every single last decoration you have in storage – including the ones you just had to buy when the price had been cut after the holidays the previous year. But what about your furry family members? At our doggy daycare and dog boarding facility in Northern Kentucky, we have had many clients sharing stories of their holiday parties and their pets. Holiday parties can be stressful, but not only for us – it can be an emotionally trying time for our pets as well. We love giving out tips when our clients are dropping off or picking up their pets for such festive events that include their pets. 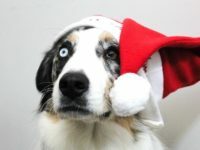 Holiday parties can be equally, if not even more, stressful on our furry family members. Even the friendlies pets can experience emotional stress with all of the guests, noise and other festivities that come with the holidays, after all this is not an everyday occurrence for our pets and most dogs and cats are not acclimated to such gatherings. For some pets, not taking part in the party at all may be the most ideal situation, just consider Rufus, Rover, and FiFi when the planning begins. Confining them to a quiet area of the home, such as a 2nd story room, where guests won’t be likely to intrude and the noise won’t be as loud can help reduce the stress. If the dog feels comfortable mingling with guests, just be sure to have a secluded retreat for them if the party becomes too much and they need space to relax or get away. Something else to keep in mind, that if the pet is allowed to be out and about to watch the exits! With party goers coming and going, pets can have an opportunity to go dashing through the opening front door and the snow. Searching for a lost furry family member is not something anyone wants to do, especially when it can be easily avoided, but making sure that the pet’s identification tags are up to date is definitely something to include on the to do list – just in case. Some guests may ask to bring their own pets along with them and if you’re unsure about how Fido will react to having guests of his own or if they have never met before, it will be in his and your best interest to have a meet and greet plan in place, a separate area for each dog, or politely decline all together. Planning for an enjoyable event for both pets and people is the number one concern. As the festivities are coming to a close, don’t forget to clear the table and keep the trash can out of reach of tempted paws. Besides the ingestion of unwanted food scraps like bones, the pet could eat some of the shiny ribbons, sparkly bows and shredded packaging from unwrapped presents. Keeping the trash out of reach or taking it out right away will keep curious noses at bay.